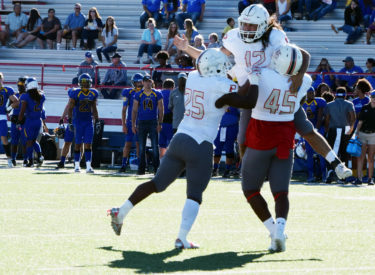 Plainview, Texas-After a dismal first half performance on Saturday, Panhandle State football rallied back to secure their fourth victory of the season 35-24 over Wayland Baptist. A great crowd showed up to support their Aggies on the road, and the team would need all the help they could get after a bleak first quarter left the sidelines deflated. The Pioneers came out ready to play, allowing the Aggies just 32 yards in the first quarter and taking two forced fumbles that led to ten points for the home team. A strong defensive effort by WBU stopped the Aggies with a sack for a loss on third down, which led to the Pioneer’s second touchdown of the game at the end of the first period. Panhandle’s defense stepped up their game in the second quarter and held the Pioneers scoreless with a meager 15 yards of total offense over the 15-minute session. Wayland went 1-11 for 11 yards passing in the second quarter and acquired four yards on ten carries rushing. Panhandles starting quarterback D.J. Scott managed 75 yards passing with four completions on 12 attempts in the quarter. Running backs Preston Baker and Orlando Haymon took three carries each to total 29 and 11 yards respectively, along with QB John Polston who rushed for five yards on two attempts in the second quarter. Wayland turned the ball over on downs on their first two drives of the second quarter, thanks to the Aggies’ heavy pass coverage. On Panhandle’s third possession, Scott sent a pass to target Kameron Taylor who covered 41 yards on the reception to set up a 19-yard rushing touchdown by Preston Baker with 10:32 left in the first half. An extra point by Cesar Tellez edged the Aggies to a ten-point deficit 17-7. The Aggie defense shut down the Pioneers for the remainder of the second quarter with sacks by David Smith and Jasper Smiley; WBU yielded negative yardage on their final three drives of the first half. The Aggies had the ball to start the second half and opened in their own territory as a touchback placed the ball on the OPSU-25. Two consecutive plays for positive yardage set them inside the fifty at the OPSU-43. On a QB keeper for a first-and-ten play, Scott was pushed back to the 39 where he lost the ball, which Wayland recovered and returned 39 yards for the TD. The Aggies blocked the point after attempt to leave the score at 24-7 early in the second half. The Aggie offense redeemed themselves on the following series starting with a four-yard run by Haymon to the Wayland-43. A pass interference call on the Pioneers on the next play put the Aggies on the 28-yardline, and Scott and Baker took the team the rest of the way on four consecutive rushes, ending with a 13-yard keeper by Scott into the end zone. The momentum was starting to shift in the Aggies’ favor with another big three-and-out series by the Darkside Defense. Smith came away with his second sack of the game on third down and a loss of 11 yards for the Pioneers. After the ensuing punt, the Pioneers’ offense was quickly back on the field after Scott’s first pass of the drive was intercepted at the Wayland-44. Panhandle’s defense pulled together for another stop to give the Aggies the ball back with 7:03 left in the third quarter. Wayland stopped the run for the Aggies on the next possession, bringing Jacob Test out to punt for Panhandle. Test was kept busy throughout the day, sent in seven times in the first three quarters. His 63-yarder at the end of the second quarter helped the Aggie defense contain the Pioneers for the remainder of the first half. With 5:21 left in the third quarter, linebacker D’Darrin Primes brought a big boost for the Aggies as he came down with a Wayland ball and a four-yard interception return. The third quarter ticked down and the score remained 24-14 with the Aggies down by ten. Panhandle held possession through the end of the third to start the fourth quarter on their own 26-yardline. Sophomore tight end Kyler Musgrave kept the ball in Aggie hands with a seven-yard rush for a first down on a fourth-and-four play. Musgrave’s work was negated by another interception for Scott that gave the ball back to the Pioneers at Panhandle’s 33. A determined Aggie defense kept the Pioneers out of the red zone, allowing only two yards on the next drive. A missed field goal attempt by the Pioneers placed the Aggies on their own 31 with a new quarterback at the helm. Junior Brandon Ramon stepped in for Scott and, after an opening handoff to Baker, threw a 68-yard bomb to receiver Nick West for an Aggie touchdown that sparked the spirit needed for a fourth-quarter comeback. Down by three (24-21) with over 12 minutes left to play, the Aggies faced the field with renewed optimism. Back from injury kicker Sterling Claphan booted the kickoff for a touchback setting Wayland at the Pioneer-25. The Pioneers took to the pass game and moved the ball 41 yards into Aggie territory; the home team threatened to increase the lead with a field goal attempt, but were short-changed once again as the ball fell just short of the crossbar. Starting at their own 34-yardline, the Aggies grounded out nine yards off the heels of Cedric Agyeman; a false start penalty took back five yards, but the front five fought back to pave the way for a 62-yard touchdown ran in by Orlando Haymon with eight minutes left on the clock. With their first lead of the day (28-24), the Aggies sent in the defensive unit to finish business, and that they did. Three incomplete passes, one rush for loss (D’Darrin Primes), a forced fumble (Kameron Lyons) and a sack (Jabrel Alexander, Dominick Bell) were all topped off with an interception by Terrell Fallon at the Panhandle 4-yardline. Fallon brought it back 28 yards on the return to the Panhandle-32. The Aggies took over with 4:17 showing on the game clock. A 12-yard rush by Baker brought the Aggies near midfield; Baker followed up with a five-yard run to the 49. Agyeman crossed the 50 with another five-yard carry and a strategic timeout called by Coach Gaskamp left the Aggies with exactly 2:20 on a first-down situation. Baker opened up with a 32-yard rush to the Wayland-14 and Haymon brought the Aggies within the ten-yard line prompting a timeout for the Pioneers with 48 seconds remaining in the game. Ramon completed a pass to Brady Barrett for no gain on third down, forcing Wayland to take another timeout at the 43-second mark. On fourth-and-five, Ramon dropped back and placed a nine-yard pass over the shoulder of Nick West which was hauled in for the final score of the day. The touchdown and PAT clinched a 35-24 comeback win for Panhandle State, who scored 21 points in the last 13 minutes of the game. The Aggies totaled 215 yards in the fourth quarter alone; more than the 192 yards amassed in the first three quarters combined. They ran for 222 yards led by Baker and Agyeman who collected 88 and 86 yards respectively and earned one TD apiece. Scott finished 8-21 in passing attempts for 108 yards, with two INTs and three sacks to his name. Ramon went 3-3 for 77 yards and two touchdowns during his fourth-quarter stint. The Aggies’ leading receiver was Nick West with 110 yards on six receptions for two TDs. Jalon Fair led on special teams with two punt returns for 25 yards; Miquel Hudson led on kickoff with one return for 43 yards; West also had a kickoff return for 39 yards to total 150 all-purpose yards in the game. Defensively, Dominick Bell and Jawan Purifoy were the team’s leading tacklers; Bell with 6.5 and Purifoy with 5.0. Bell also contributed with .5 sack and one tackle for loss. David Smith was credited with two sacks and 2.5 tackles for loss totaling 20 yards. In all, the Aggie defense took 72 lost yards from the Pioneers, forced one fumble, had five sacks, two interceptions and two pass breakups. Head Coach Russell Gaskamp exuded pride for his team’s ability to bounce back and not give up. Gaskamp was disappointed, however, in the lack of discipline that showed up in the 13 penalties accrued by the Aggies throughout the game and in the six turnovers which amounted 17 points for their opponents. Panhandle State football has a long trip on the horizon as they travel to Phoenix, Ariz. This week for a matchup against No. 16-ranked Arizona Christian University. The Aggies own a 4-1 overall record and will meet with a 5-1 ACU team on Saturday, Oct. 14 at 7 p.m. (MST). Fans unable to make the trip in person can enjoy the game via live stats and video links available online at opsuaggies.com on the Football Schedule page.